Trace snow over night with an inch of snow in the forecast for today. Groomers have headed out this morning to give all of BREIA’s trails some fresh tracks. Take advantage of it as you never know when it may be your last excursion of the season. As a reminder, please no dogs on BREIA’s trails and stay off the tracked portions with everything except skis. NO BARE BOOTING! May have some wet spots and probably the last to be groomed today. Trace snow over night with an inch of snow in the forecast for today. Groomers have headed out this morning to give all of BREIA’s trails some fresh tracks. Take advantage of it as you never know when it may be your last excursion of the season. As a reminder, please stay off the tracked portions with everything except skis. NO BARE BOOTING! Check our webcam for conditions outside the Egypt Road warming hut. NOTE: BREIA does not rent equipment. You can rent skis and snowshoes at the Boonville Search and Rescue hut located at the far right side of the Tops Plaza on Route 12 in Boonville. 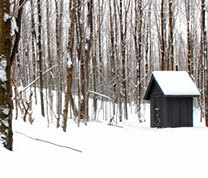 Warming Hut will be open from 10 am – 4 pm Saturday and Sunday. Your driver’s license is required as a deposit and a $5 donation to Search and Rescue is greatly appreciated. Check out the Boonville Search and Rescue Facebook page at www.facebook.com/BoonvilleSAR located in the Boonville Tops parking lot at 13209 State Route 12, Boonville, New York 13309. BREIA trails are open to the public without charge during daylight hours. Skiing and snowshoeing only when conditions permit. At other times, hiking and mountain biking is encouraged. Check the activity icons below. Enjoy! As a reminder, please No Dogs on BREIA’s trails and stay off the tracked portions with everything except skis.